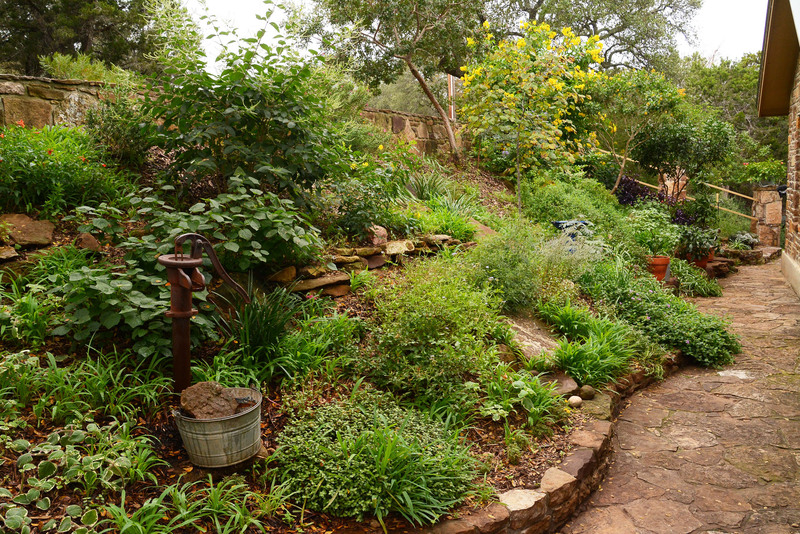 As Lake Austin Spa Resort’s Director of Flora and Fauna, Trisha Shirey knows pretty much everything about organic growing in harsh-as-heck conditions. Now, she’s put all that knowledge into an easy hands-on guide for you: Vegetable Gardening in the Southwest. Covering USDA Zones 4-10, it includes monthly detailed lists, plant profiles, building beds, pest management, fertilizing and answers to all your questions. Oh yes, she covers staking, too. This week, Trisha joins Tom with a few of her tricks and tips. One is how to shade heat-sensitive plants like dill and cilantro to extend their season. Meet her in person at The Natural Gardener at 11:30 a.m. on Feb. 14 for her talk on natural insect control and pick up a signed copy of the book. Perfect Valentine’s gift! One trick to her organic pest control and pollination success is mingling flowers with food. It’s also so pretty, like this trio of Dicliptera suberecta, lamb’s ears and Swiss chard. Viewer Picture goes to Tracie Storie, whose fall-blooming loquats attracted lots of friends. There’s plenty of food to go around for the bees and butterflies, like this Red Admiral. My neighbor’s young family returned bees and butterflies to their yard by adding flowering edibles to vegetable beds. Since YardFarm got them started by removing front yard grass and building raised beds, the whole family (even the littlest one) is out there to tend and harvest. I really like how my neighbor jazzed up her PVC hoops with flame-colored spray paint. But a small amount of nutrients may be absorbed the leaves, especially vegetable seedlings, lettuces, herbs, and other crops with thin, soft leaves. Find out more. Since it’s time to plant roses, she picks fragrant ‘Sharifa Asma’ as Plant of the Week. This David Austin rose is tough as nails in her garden and very popular with friends of all ages! On tour, we head to Farmshare Austin where they’re filling empty dinner plates and nurturing young, aspiring organic farmers in Central Texas. Farm Director Lorig Hawkins works with the first students in their Farmer Starter pilot project. Hands-on lessons in soil prep, planting and harvesting join instruction in business management. Enticed by Farmshare Austin’s mission, Lorig joined Executive Director Taylor Cook and Lead Instructor Marissa Lankes. To give the students a full-on farming experience during the six month program, they constructed canvas tents outfitted with wood fire stoves. Lorig explains how they keep crops healthy with rotation, cover crops, and fertilizing in clay soil. They plant successively, so as one crop ends its cycle, the latest seedlings are big enough to harvest. Through rotation and turning plants back into the soil when they’re on the wane, their pest problems are minimal. This year, Lorig discovered that bok choy was a great trap crop, so they’ve left it to distract the bad bugs. They also count on flowers to attract beneficial insects who pollinate while chomping down the evil ones. Their fresh picks head off to service organizations in Austin and to their partner the Sustainable Food Center. PLUS, starting February 6, they’ll be teaching classes at Boggy Creek Farm designed just for home gardeners! Here’s how to enroll. ← Landscape “architecture” for everybody!